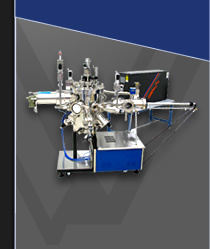 SVTA offers a comprehensive line of sample manipulators for MBE and MOCVD systems. SVTA's sample manipulator is equipped with XY stage and Z manipulation to aid in substrate positioning and sample transfer. Each substrate heater module and holder is carefully designed for the intended growth environment. Motorized substrate rotation and temperature feedback controller are available for best heating and growth uniformity. Substrate sizes from 1" to 8" wafers are available.